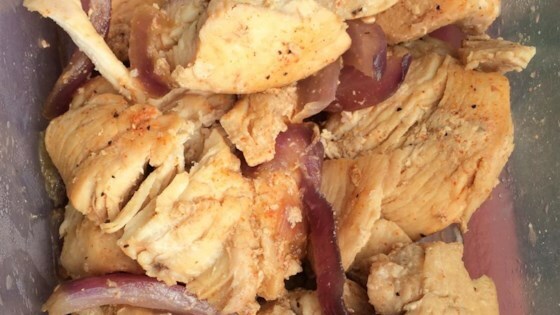 "This is baked boneless, skinless chicken breasts topped with garlic and onions and baked in a lemon and white wine mixture." Layer the bottom of the baking dish with 1/2 the onions and 1/2 the garlic slices. Pour lemon juice and white wine into the baking dish. Season chicken with paprika, salt, and pepper, and place in the baking dish. Top with remaining onions and garlic. Easy meal of Italian flavors on chicken and potatoes! Good flavor but I suggest cooking it at 400. Onions were not cooked. Make it with sliced potato and WOW! Excellent and easy. I put a lot of the seasoning on it and added garlic powder. Plus I covered with foil to trap the moisture and others had recommended. I will make this again.